Children: For those aged 5-11 we have games, sports and arts & crafts on Bingfield Park. Children will compete in teams over the week with medals given out on Sunday afternoon. Our theme is “Making TV” and we’ll be telling stories about Jesus while making our own TV programs. Youth: For those aged 11-18 we’ll have or Football School on the Bingfield Park pitch. Qualified coaches will help improve your game and offer you the chance to compete in different tournaments. We’ll also have a special freestyle skills training day during the week. We’ll end the week with a service of celebration on Sunday afternoon. The service will feature songs, stories, photos and feedback from the week and our prize giving ceremony. Afterwards we’ll have a fun day in Bingfield Park with barbecue, children’s disco, stalls, sports and games. 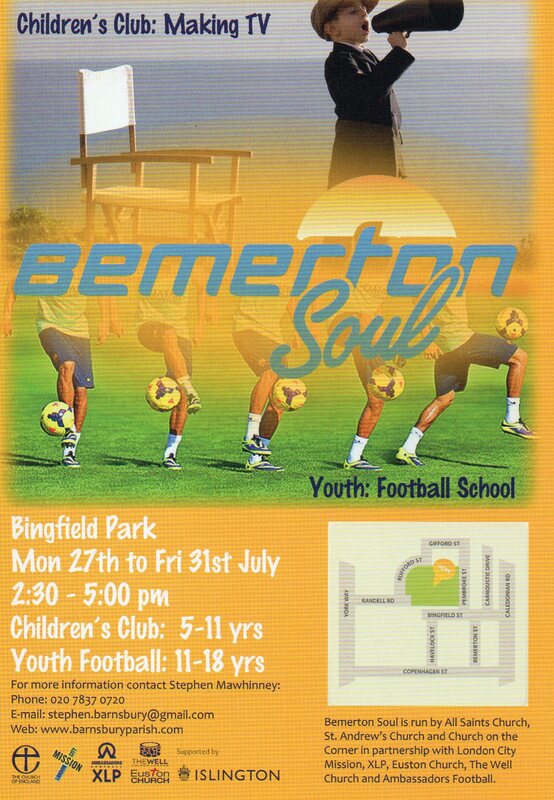 Bemerton Soul is free and is open to all local children, young people and families. For your child to attend you will need to complete a permission form and they will be available at reception during the week.